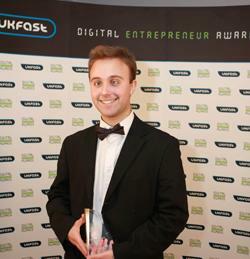 Projects Abroad were winners of the Digital Entrepreneur award for Best Community Project of the Year. Projects Abroad and eighteen other digital businesses in the UK had their entrepreneurial talents rewarded at a glittering awards ceremony held in Manchester, England, on Wednesday, 1 December. Now in their second year, the Digital Entrepreneur of the Year awards are aimed at discovering and rewarding the best businesses on the web and were expanded this year to accommodate a phenomenal number of applications from high-caliber companies.